Paul F. O’Keefe is associate provost for research administration. He is responsible for pre-award research administration, research integrity and compliance, and postdoctoral affairs. 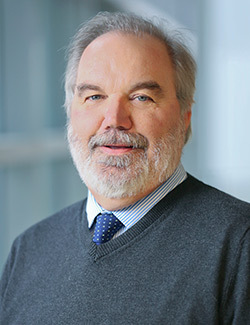 Prior to Brandeis, he was director of research administration for Gene Regulation Laboratories, Inc. Before that, he served as assistant vice provost for research and director of the Office of Research and Sponsored Programs at the University of Massachusetts Boston. Paul has co-authored several peer-reviewed articles in professional journals including Pediatrics, the Journal of Pediatrics, the Journal of Marriage and the Family, and the American Journal on Mental Retardation. He has also made numerous presentations and led workshops on a variety of research administration and compliance topics at national and regional meetings of professional organizations such as the National Council of Research Administrators (NCURA), the Society of Research Administrators International (SRA), and the National Association of College and University Business Officers (NACUBO). From 2008-2013, he served on the Journal Review Board of SRA’s Journal of Research Administration. Paul is a member of numerous professional research administration organizations, including NCURA, SRA, Public Responsibility in Research & Medicine (PRIM&R), the Association of University Technology Managers (AUTM), and the National Organization of Research Development Professionals (NORDP). Paul holds a BA in economics from the University of Massachusetts Boston.